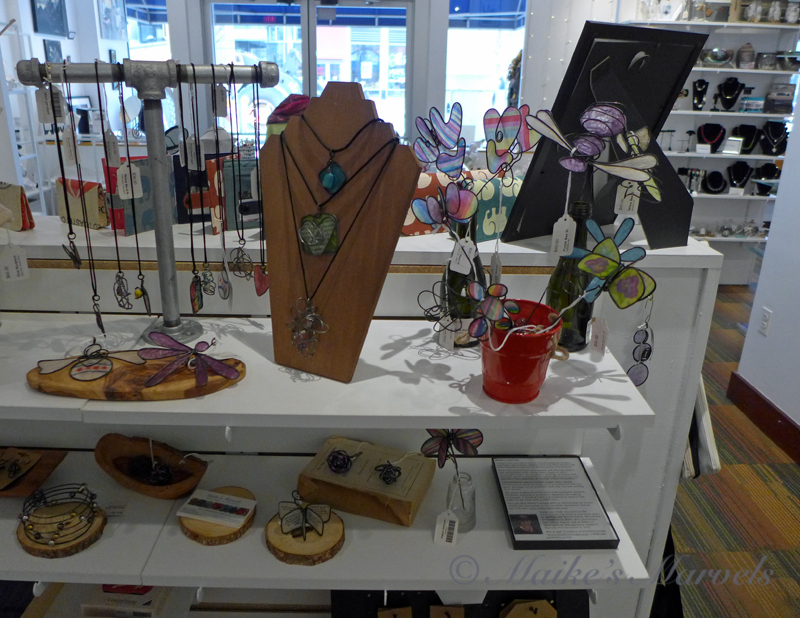 Last week I did a Pop Up Gallery Refresh, and also moved shelves in the Downtown Evanston Gift Store. 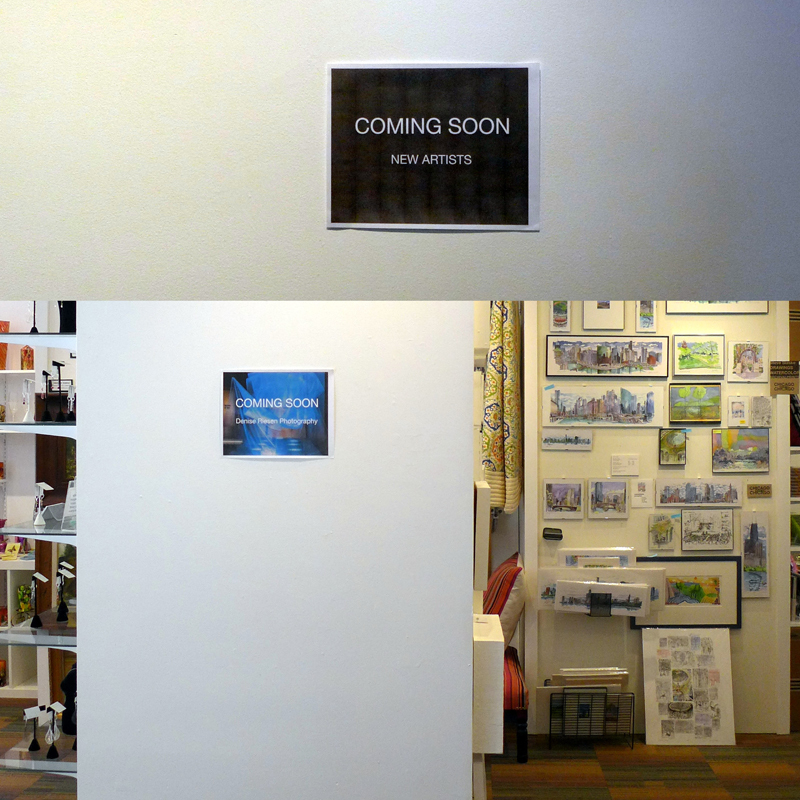 The Evanston Pop Up Gallery has changed ownership and is now Artem Pop Up Gallery. With utility work happening at Sherman Avenue, it looks like the rebranding is more dramatic than it actually is. I brought in some more garden stakes so people can actually bring in spring both indoors and outdoors for Easter. New owner Sarita Kamat came from the city of Belgaum in India 16 years ago and now lives in Skokie. Artem Popup Gallery is truly a family business now, with her husband Salil and daughter Riya being actively involved in the day-to-day operations, while son Varun also offers support. Sarita had a boutique in India, and currently works with watercolors and acrylics. With a Bachelors in Accounting and a PG in Business Management, along with Art School expertise, the gallery is in excellent hands. As Sarita Kamat Designs, Sarita works with glass paints to create her vibrant and whimsical hand painted glass jewelry. She also paints and works with mosaics. The sales staff remains the same, and a lot of artists are planning to stay on as well. 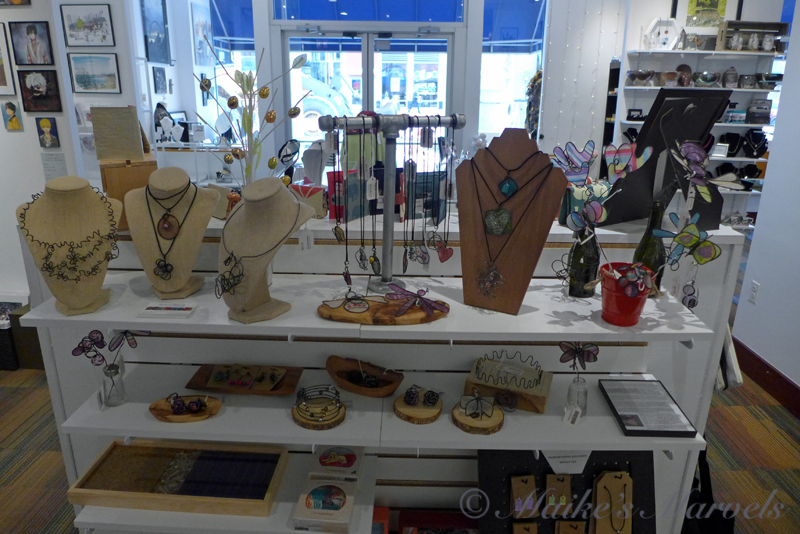 Meanwhile, space is being made for new artists, with a focus on handmade gift items. I like the warmth of my new shelving, and am excited that the moment after the move one stake already went to a new home. I wore my floral collar on the way in to channel spring. It was promptly suggested that I put this springy steel wire collar on display as well, rather than carry it back out with me. The Artem Pop Up Gallery website will be up soon. Meanwhile, the Facebook page has the latest updates, as well as Instagram. 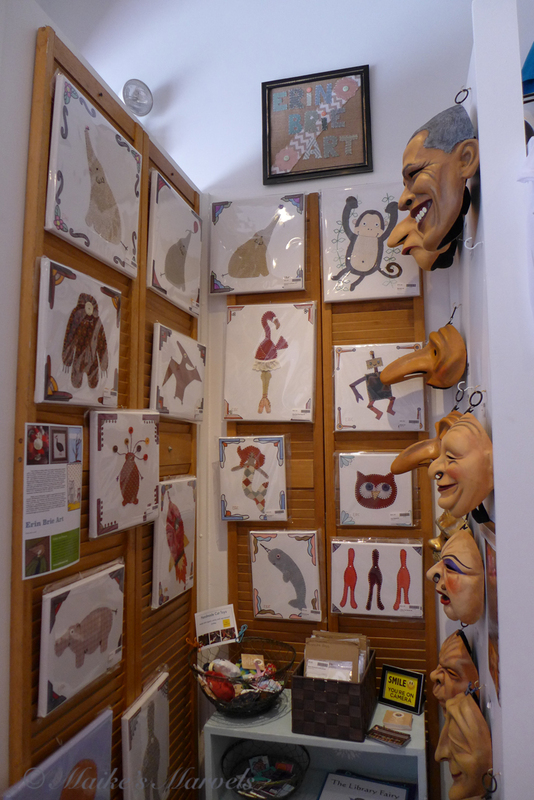 So come on in and peruse the ever-evolving and rotating art of a variety of Evanston-based and Chicagoland area artisans. Lots of cute gift ideas for Easter, Spring Celebrations, and everyday love tokens. 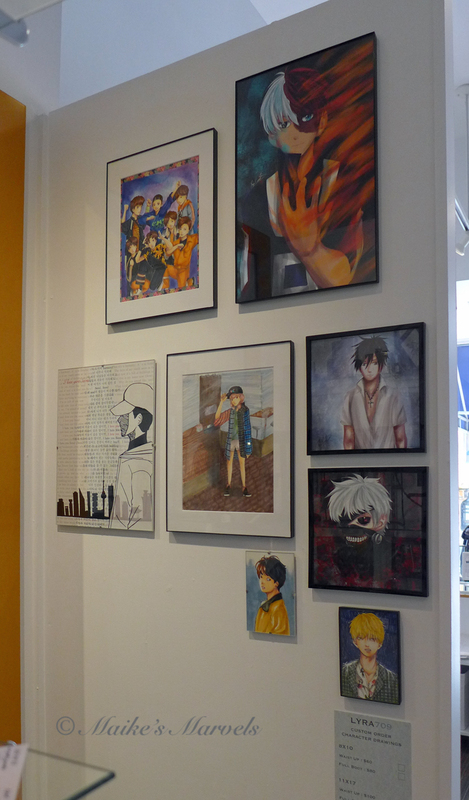 Artem Pop Up Gallery is located at 1627 Sherman Avenue in Evanston, Illinois, across from the Barnes & Noble and two doors down from the new Collectivo Cafe. If you are an artist interested in consigning, there might be a space for you! The angels will move as well. This entry was posted in Maikes Marvels Creations and tagged #ShopEvanston, #shophandmade, Artem Pop Up Gallery, consignment, Downtown Evanston, Evanston Gift Shopping, Evanston Pop Up Gallery, garden stakes, gift boutique, Homeware, Plant Stakes, Sarita Kamat, Spring refresh, steel wire jewelry.